There was a surprising degree of optimism at Campaign's breakfast briefing about how creatives can move "upstream" if they team up with management consulting firms. 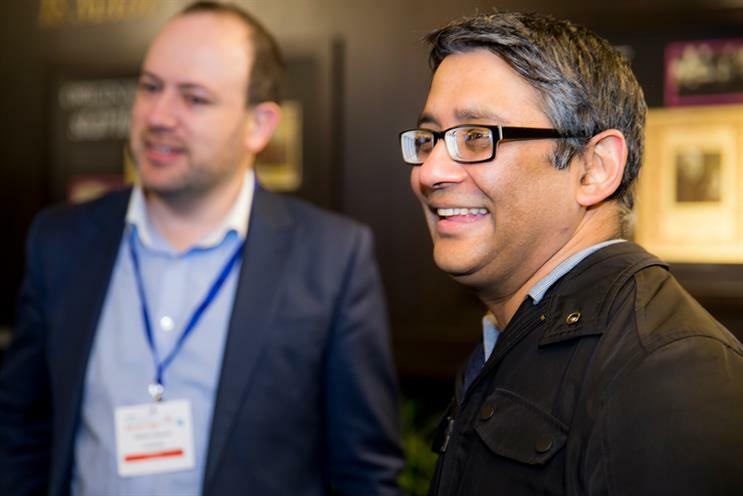 "I’m quite buoyant about where this could lead next," Joy Bhattacharya, managing director and UK & Ireland lead at Accenture Interactive, told the event, which was held in association with SI Partners. He was speaking alongside Ben Bilboul, the chief executive of Karmarama, on a public stage for the first time about how they have found working together since Accenture Interactive acquired the creative agency in November 2016. Bhattacharya said moving further into creative services was logical because Accenture Interactive, the digital marketing and design arm of consulting giant Accenture, wanted to "make sure we are at the heart of any experience-led change" for clients that are seeking digital transformation, particularly around the customer experience. What Accenture Interactive had been "missing" from its own offer was "the credibility and authenticity to engage with CMOs", Bhattacharaya said. Bilboul said the agency was happy to sell because "we were blown away by a few things" – by "the scale of Accenture and Accenture Interactive", "the level they’re working at with clients" and "their respect for creativity". Karmarma has found "we’re getting involved in slightly more upstream conversations", Bilboul added. "What we’re seeing is the involvement of marketing people in much more strategic conversations on the client side. This concept of putting the customer at the heart of conversation isn’t just a platitude. It really is happening." Karmarama has been allowed to keep its own identity and existing office space in Farringdon. "I’d characterize Joy and Accenture Interactive as sensitive lovers," Bilboul said. "We haven’t looked to completely integrate on day one." He added: "We’ve got to be a great talent magnet in the [advertising] industry. We’re really careful about anything that might affect that negatively." Biboul said that Karmarama plans to keep pitching for advertising work and it is collaborating with Accenture Interactive on joint projects with half a dozen clients. Bhattacharaya said Accenture Interactive and Karmarama have been keen to push a new model of remuneration, called "growth agenda", that links their fees directly to a client’s business outcome such as hitting revenue targets. He explained how they have been working for a "leading car manufacturer" in the luxury sector. "Rather than talk about creative design, execution of platforms and campaigns, we’re trying to get down to what’s the growth target that they want to meet and how can combined Accenture Interactive-Karmarama be their partner of choice that can ultimately get remunerated on each car sold," he said. "That is when you’re in a position where you can think right from ideation [coming up with an idea] to thinking about campaigns to even looking at how cars get delivered to distributors and the test-drives and trying to join that whole process together. "We getting compensated not on the ad, not on the digital marketing, not on the platform, but tying that all together on each car sold." Bilboul admitted payment by results is not new for advertising agencies but said "the difference is the scale and order of magnitude" that Accenture Interactive has. "Agencies find it hard to bank-roll client projects at significant scale for large periods of time," Biboul. "You might take a small element of your profit – you might take 5% of the total value of the project – and you put that at risk. You’re talking about relatively small numbers in the overall scheme of things. "What Accenture and Accenture Interactive are doing is on a far greater scale. They’re saying to clients let us take responsibility for selling the product or that part of the consumer journey – ‘we will go ‘all in’ on being rewarded on the success of that’. "You need resources to do that – certainly agencies like Karmarama haven’t had that." Bhattacharya said Accenture Interactive’s understanding of business outcomes and its growing involvement in creative services meant it could appeal to both a client’s chief financial officer and chief marketing officer. Accenture Interactive is likely to make more acquisitions in the agency space after buying ten businesses in about the last five years, according to Bhattacharya. "We actually don’t worry so much about P&L," he said, explaining how Accenture Interactive assesses a potential target. "The real thing is what’s the synergy that it drives and how can we be at the heart of the conversation from idea to execution to operation." However, despite Accenture’s growing spend on acquisitions, he maintained that Accenture Interactive could still take its time to build the group. "I don’t think there is any rush [to demonstrate] that this is all a great, integrated offer. I think we should take our time." He added that Accenture Interactive’s message to clients was that "we want to accountable with you for results". The ad industry is facing growing questions about transparency and Bhattacharya said Accenture Interactive is increasingly being asked by clients to help set up in-house agency operations, including media trading desks to handle programmatic ad-buying. That could potentially be a major challenge to media agencies, although Bhattacharya played down how "disruptive" the move to set up in-house trading desks for clients might me. Bilboul said it made sense for an agency such as Karmarama to focus on being strategic and letting clients take some work in-house because the agency was "not tying our business success to every piece of [marketing] collateral". The second session at Campaign’s breakfast briefing looked at the wider trend for consulting firms to move into creative services and marketers broadly welcomed what they had heard from Accenture Interactive and Karmarama. Pippa Dunn, founder of Broody, which invests in creative businesses, and former chief marketing officer of EE, said: "I was probably more sceptical before I heard these guys talk than I am now. I think it’s actually a really interesting model. "One of the things that always frustrated me [as a marketer] is you couldn’t get the creatives to work upstream enough with you. Quite often because they did not necessarily understand how a business works, how it’s going to make money. "If you can get people to inject creativity at the at the start, you’re going to get a much better solution." Americo Silva head of digital and social media at Shell said: "This was music to my ears. That’s exactly what clients are looking for these days. Their businesses are being disrupted from multiple angles. This type of end-to-end solution makes a lot of sense to me." But David Golding, the group chief strategy of Adam & Eve/DDB, said he had doubts, even though Accenture would be good at ensuring the brand experience is consistent across "all consumer touchpoints" – an area where creative agencies "aren’t the best". He warned: "Where I think that it stops is the big leaps and the big sparks [of creativity]. If I was a CMO, I wouldn’t be overly thrilled about this relationship [between consultants and agencies]. "I’d be happy that Accenture had the ability to have branded thinking while they were developing my customer experience. "But what I wouldn’t want too much upstream thinking ultimately defining what a brand stands for and where it stands in the market. "I think the CMO should be able to come up with a giant leap or a surprise positioning that … set new agendas for the brand. "They need a different culture and they need a different stimulus and the creative people who come up with that are not comfortable bedfellows with the consultants." The third session focused on the outlook for M&A in the agency sector. Tristan Rice, partner at SI Partners, said management consultants were still in "an experimental phase" in terms of moving into the communications sector. "It would be foolish to think the marketing world is going to sit on its hands while the consultants eat their lunch," he said. "I don’t think it’s a clear-cut conclusion that the consultants are going to take over. "We’re seeing a vast array of buyers from inside and outside the marketing world – IT consultants, systems integrators and so on." Rice said consulting firms are most interested in agencies involved in user experience and service and product design that can be used as "a new business machine". Demand has been driving up valuations as an agency is "not being priced on its earnings, it’s being priced on what it can do for the wider business", he said. "Where there is real transformative value, real strategic value to the acquiring business – that unleashes a new skill that creates a new revenue stream – it is quite feasible to get to two to three times revenues, rather than six to eight times pre-tax profit." Mark Creighton, chief operating officer at Dentsu Aegis Media Network, said it has not been coming up against consultants when it competes in M&A. "In the last year, that competition is still our traditional network partners and some private equity and not so much the consultants," he said. "But when you’re trying to build services and capabilities in the digital economy, inevitably you find that competition diversifying." Creighton said it meant "founders and owners are going to be looking for different things" from buyers and Dentsu Aegis was working hard to show why it could be a good acquirer and would look after an agency’s culture. "We’re not complacent," he said. James Freedman, executive chairman of independent agency Zone, which is both an acquirer and potentially a target, said: "We’re in a highly acquisitive sector. We always have been. I think what’s changed is the universe is much bigger now. "Joy and Ben really articulated the vision brilliantly and I got it and I absolutely think it is about the customer at the heart of the experience. Some of the consultants offer a very compelling proposition." Freedman said cultural fit and chemistry was vital when he was making acquisitions. "It’s all about people. You pretty much know from the first meeting," he said. Lorna Tilbian, head of media at Numis Securities, said she understood why Accenture Interactive might be interested in the capabilities, rather than the profitability, of an agency that it acquired, but she pointed out most listed companies that she advises still focus on profits. "My clients think about the P&L first and foremost," she said. Tilbian, who worked on Dentsu’s £3.2bn purchase of Aegis in 2012, believes there is scope for a mega-deal where two large companies merge in the marketing services sector. "I think at this stage of the cycle, you always get the really big mergers," she said, noting there have been eight years of economic expansion in the US. "People run out of cost-cutting, they need to grow, and so getting together and cutting costs rather than innovating and coming up with ideas – they’re harder to come by." Tilbian said the management consultants entering creative and marketing services "makes sense". She said: "It’s interesting that you call them consultants. We used to call them accountants and auditors. That business is not high growth [any more]. So they moved into consulting. And then after they moved into consulting, [they wonder] how do you get closer to the consumer? Well, the agency bods are the ones who are closest. So it’s the culmination of that."